Roast hazelnuts until golden. Rub the hit nuts in a tea towel to remove skins. Roast seeds and spices separately until fragrant. Grind nuts, seeds, spices and salt in a mortar and pestle or food processor until coarsely ground. Dukkah will keep in an airtight container up to 2 months. Preheat oven to 200C/ 400F. Spread dukkah onto a plate and press lamb into it, covering all sides. Place in a lightly oiled baking dish and bake for around 20 minutes until meat is cooked through and no longer bloody. Rest the meat for around 5-10 minutes before slicing. Combine the yoghurt and ground cumin and set aside. Cook freekeh according to packet instructions. 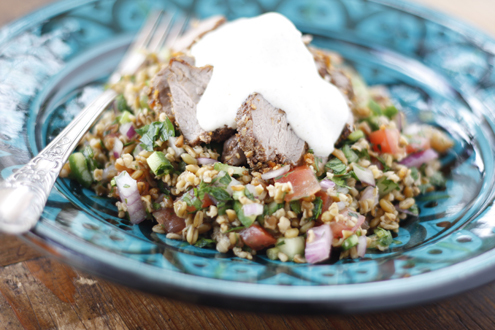 Combine freekeh with remaining ingredients for tabouleh. Mix well. Serve several slices of lamb per person along with a dollop of spiced yoghurt and some tabouleh. Please note: Like quinoa, freekeh might be well tolerated because of its high fibre content (and low GI) and therefore could possibly be increased in content if desired and if you find your blood glucose levels are okay.